New Delhi, April 1: The Indian Premier League (IPL) is no less than a festival for the fans in the country. It is the perfect mix of cricket and entertainment. Not only does it entertain them with boundaries and sixes, but also gets them to witness their favourite stars playing for their favourite teams. Looking back at the cash-rich league since its inception in 2008, it is clear that the IPL is more than just the fours and sixes or the wickets. Right from the start, every season has seen it's share of controversies. R Ashwin Run Out Jos Buttler Mankad-Style in IPL 2019, This is Second Time English Man Got Out In This Fashion; Watch Video. 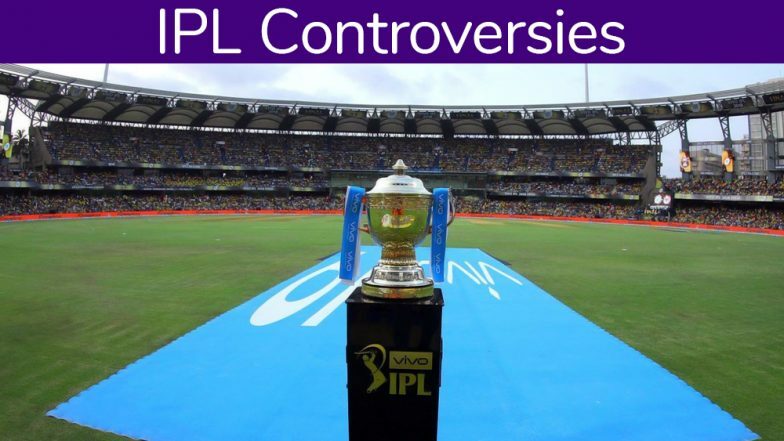 Be it the "Slap Gate" in the opening season or "Spot-fixing fiasco" in 2013, there has not been one season when the tournament has not been marred by controversies. R Ashwin-Jos Butler 'Mankad' Controversy Rocks VIVO IPL 2019: All You Need to Know About The Origin of 'Mankading'. April 18, 2008 was the day when the carnival began and as everyone expected, IPL quickly captured the imagination of fans as Kolkata Knight Riders posted a massive 222/3 against Royal Challengers Bangalore and went on to register a massive 140-run win, thanks to Brendon McCullum. The former Kiwi skipper hit a spectacular 73-ball 158 to set the ball rolling in what has gone on to become the most successful domestic T20 league. Everything seemed to have been going perfect for the BCCI and the fans until things turned ugly after just 12 days. On April 25, off-spinner Harbhajan Singh, who was then leading the Mumbai Indians, was trapped in a major controversy after he was pictured slapping then Kings XI Punjab pacer S. Sreesanth in Mohali. Sreesanth was later seen crying bitterly on the ground while Harbhajan was banned from taking further part in the season, beside being banned from five ODIs as well by the BCCI's disciplinary committee. According to reports, after Mumbai's 66-run loss to his team, Sreesanth had told Harbhajan Singh 'hard luck' which provoked the spinner to take the action and stirred a major controversy in the inaugural IPL, a start which no one had wanted. The second season of the IPL saw the Pakistan Cricket Board first refusing to grant permission to its players to come and play in India after the 2008 Mumbai attacks. Simultaneously the Indian board also decided to keep the Pakistani cricketers away from the league. While there have been talks and requests quite a few times over the years, but the IPL has not opened its doors to cricketers from the neighbouring country. Lalit Modi, the man who started the league was ousted minutes after the final of the third edition for financial irregularities. It was a huge blow and the biggest controversy till then as Lalit Modi was charged on five counts -- shady initial bids of Rajasthan Royals and Kings XI Punjab; a suspect broadcast deal with Sony; bid rigging of two new franchises this year and his behavioural pattern. Chirayu Amin was appointed as the new chairman. South African cheerleader Gabriella Pasqualotto was thrown out by Mumbai Indians for blogging on how cheerleaders were treated poorly and cricketers misbehaved with the girls. "I was sent home as if I was a criminal. I was treated as if I had taken drugs or done something awful, and I was never offered an opportunity to give my side of the story. It's a joke. There were cameras everywhere at these after-parties, watching what they got up to. The guys treated us like piece of meat. We couldn't go anywhere without the crowds mobbing us," she had told reporters after returning home.